Physicians, nurses, and safety experts comprehensively review sedation and analgesia to provide a completely new reference guide to safe sedation practices consistent with existing guidelines. Starting with an integrated review of the basic physiology and neurobiology of the sedated state, the authors proceed through clinical guidelines and practices, and conclude with an examination of quality-outcome measures and processes. 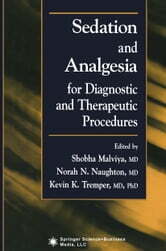 They also review current mandates for safe sedation practices and address the key clinical issues of pharmacology, monitoring, and recovery. Special tables and figures throughout the book summarize protocols, regulatory requirements, recommended dosages, monitoring requirements, and quality assurance tools.